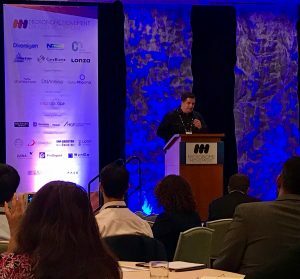 Jeff Heiser, Boston Analytical’s Director of Microbiology recently presented Application of Multivalent Vaccine Manufacturing Testing Schemes in cGMP Characterization of Microbiome Defined Drug Products at the 3rd MDD Summit in Boston. He discussed navigation through the microbiome regulatory process through the established methods traditionally utilized for multivalent vaccine manufacturing programs. Other important points he discussed were how Environmental Monitoring (EM) program design requires additional processes for microbiome product manufacturing and the implementation of anaerobic best practices to achieve accurate characterization of microbiome drug products. Jeffrey Heiser is a cGMP pharmaceutical microbiology testing expert that has spent time in the industry in cell culture manufacturing contamination response, rapid micro method evaluations and multivalent vaccine testing, design and validation. Jeff directs the Microbiology side of Boston Analytical’s contract lab service where he implements both routine and non-routine testing programs. Most recently, Jeff has been heading up the QC program design and implementation for Boston Analytical’s Microbiome client base. Meet Jeff and learn more about Boston Analytical’s Microbiology lab services at the Microbiome Movement Skin Health and Dermatology Conference in September in San Diego.